Château de Lassus is built in 1550 by Antoine Le Boucq named Carnin Lord off Lassus. He is buried in 1562 in the church of Saint Jacques of Tournai (Doornik). 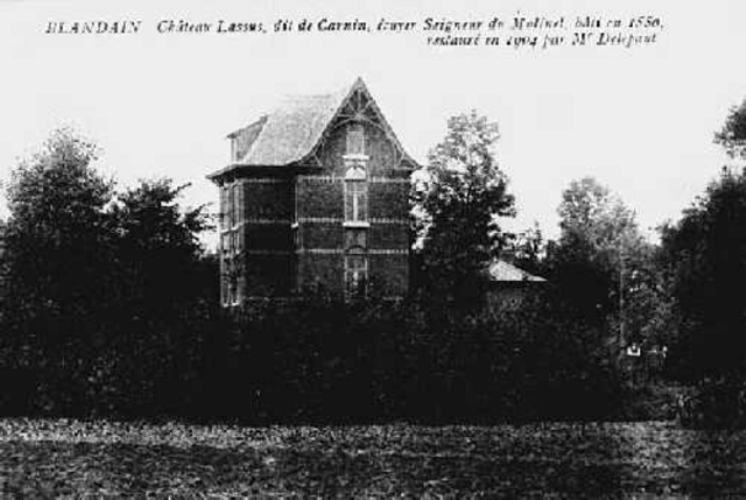 Other members of the family are buried in the church of Blandain, Nicolas-Philippe Le Boucq named Carnin at 1700, his stone grave lays in the left side of the church of Blandain, Denis-Francois-Lamoral Le Boucq named Carnin Lord off Lassus and Molinel at 1708 ( epitaph at the right side of the church) and his son Philippe- Francois at 1736 (left side). The generation of the Lords of Lassus and Molinel stops at Docteur Delepaut, who herited the castle from his wife. He pulls down the castle at 1844. We haven’t found any records of this state of the castle yet . It’s assumed that the castle had been a fortified castle-farm like others which can still be seen in the region. Upon a part of the foundation the present hunting-lodge is built at 1904. There are old postcards still existing. For the very first time in its history the house was sold at 1924. When it was sold again in 1989 the house has been abandoned for 20 years. The house has been radically restored and the garden got its present shape. At 2002 the house was sold again and the 24 off March 2008 we, Nin Van Nin and Karel Hoffesommer, became the new owners.